1973 Jensen Interceptor - I've always liked the Interceptor. An Italian designed body (Touring), a US V8 (Chrysler) and a British Interior. What's not to like? This is a 1973 Interceptor. In Jensen-speak, that makes it a Mark III, J Series. Translated, that means it's the most luxurious Interceptor ever sold. This Interceptor is in incredibly nice shape. I don't think I've ever seen one in painted bronze before. It looks great. The seller calls it "as nice of a Jensen Interceptor III you will find anywhere in the world." Based on the pictures (of which there are only 4, as this is a Craigslist ad), he may be right. Located in Pheonix, AZ, click here to see the listing. 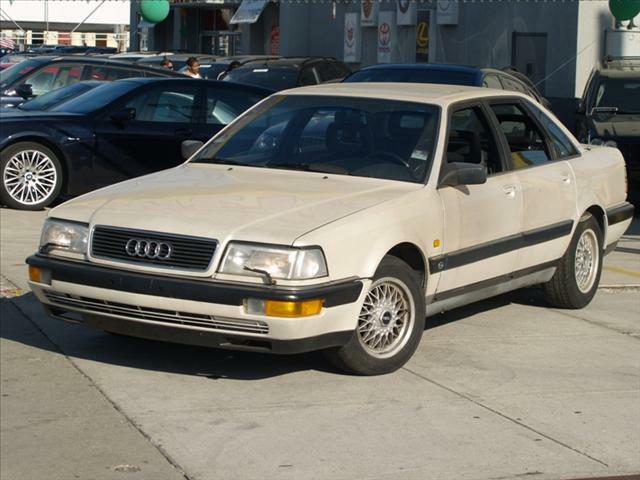 1991 Audi V8 - This could wind up being a bargain for someone. As I write this, it's under $1000.00 with less than 2 days to go in the auction. This was a pretty amazing car in its day. It's still impressive today. The engine is a 32 valve, DOHC, 247 HP, 3.6 liter V8. Top speed was in the 140 MPH neighborhood. Best of all, it has Audi's Quattro AWD system. Handling in wet or dry conditions is very, very, impressive for a large car. There are things to look out for on older Audis. The automatic transmission is prone to failure. It's extremely expensive and new ones are tough to find. Audi power windows and sunroofs are legendarily bad. At some point you'll need to do some work on them. Count on it. This car needs some work. There are some broken lights and a bit of rust on the rockers. But, those jobs are relatively easy and not too expensive. Located in Brooklyn, NY, click here to see the eBay listing. 1968 Custom Built Jet Car - Yikes. "This vehicle was dreamed up in approx 1960 when futuristic Batmobile vehicles, space ships and other vehicles were starting to show up in TV series and more." LSD was legal and plentiful in the 1960s, too. That might better explain this car. I don't know what to say about this... Thankfully, it doesn't really have a jet engine. Check out the eBay listing. The Jensen is great looking ride. The Audi, well, if I had the choice I'd rather try and find one of those early trapezoid wagons like the 200 you had listed a while back. They are becoming rare as hens teeth. The Fireball XL 5 car. You sometimes don't know where to start with something like this. Maybe the much loved Uncle Earl really intended to finish the car and make it roadworthy before he was sucked into a wood chipper in the early 1970's. Maybe he dreamed of the car making the cover of Popular Mechanics. Who knows? All we know is that his extended family pooled their scant resources and completed the car. Maybe it's the 250 MPH speed, or the assertion that "GM EXECUTIVES HAVE HEARD ABOUT AND VISITED THIS VEHICLE YEARS AGO BECAUSE OF SOME OF THE TECHNICAL DESIGN USED IN ITS BUILDING." You almost get the feeling that a bunch of mischievous MIT engineering students posted this as a prank, and now are howling their asses off in Boston. Imagine the physics involved in "BALANCE EXACT CENTER OF GRAVITY COUNTER BALANCED." I'm still trying to figure out what "ALTERNATE FRONT AND REAR STEERING" is all about. I love the line "THIS VEHICLE IS EXTREMELY RARE AND A ONE OF A KIND." Too funny... The Star Trek inspired "VARIABLE TRACTION DEFLECTOR" is an added bonus. I'm surprised the military did not come around for a look. We could have ended the Cold War years sooner if we had this technology. The kicker are the lines "ITS NOW BEEN HIDDEN IN BARN PICTURED AND RARELY EVER REMOVED" and "VEHICLE HAS BEEN HIDDEN AWAY AND MOST DO NOT EVEN KNOW IT EXIST." I'm guessing back in the 1960's some folks were really pissed off after the local Amusement Park was burglarized. Always loved the Jensen Interceptor, a very classy car. Interesting you should post it along with your earlier post on the VW from Brazil. The Brasinca Uirapuru was another sports car from Brazil, not that successful commercially, the interesting part is that the design is very similar to the Jensen Interceptor. 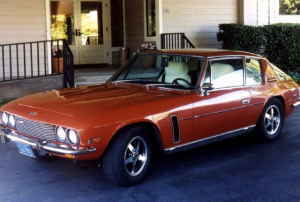 This car was not a copy, it ended production just as production for the Jensen started. The car from Brazil also was hand build from steel, using a Chevy power plant, so there were quite a few similarities. Thanks for the info Richard! I just looked up the Brasinca Uirapuru! Wow, it really does look like the Interceptor. After years of cruising though Hemmings and ebay listings, I've been on a kick lately where I'm trolling through a lot of classified ads from South America. That is how I found the VW SP2. The thing is that the car prices from Brazil were really high. Then I found arcar.com from Argentina. They had a bunch of inexpensive old Mercedes 170 wagons and pickups that I had never imagined existed. It may sound dumb, but I still get a thrill out of finding obscure cars. It is the same feeling I got many years ago when I was a kid and got the "new" Corgi catalog. This is how countless American kids were introduced to gems like the James Bond Aston Martin and the DAF City Car. You can check out some old Corgi catalog reprints on zeigermann.com. "It may sound dumb, but I still get a thrill out of finding obscure cars." It doesn't sound dumb at all... It's for the same reason that I started writing this blog. Then click on "Autos Antiguos en Venta" found over the photos of the cars. This will bring you to a page with lots of cars on it. Click on the numbers at the base of the page to scroll to the next set of vehicles. When tou have reached the end, say page 20, click on the three dots at the end of the number line "..." which will bring you to pages 21-40... and so on. You can also search by make. While my command of "Porsche-O-Geese" is poor, this site is so easy that even a moron like myself can figure it out. Jon, thanks for the link, that is one awesome site!! The prices are very interesting, some are very cheap, ie 68 Gordini that looks new for $2500 and then expensive like a 82 RX7 for $20k (I should take better care of mine if its worth that down there!). I love finding obscure cars, the Other section on eBay is a regular thing for me, of course this Blog and a couple of hours on Craiglook and now of course ARCar. Its a bit of an addiction but I guess there are worse things one could be hooked on! Another site, since we are giving out suggestions, is wirewheel.com Its all mainly British stuff on there and its not cheap, very rare stuff, both modern and new. They have a 2004 MG ZT Wagon on there for $25k including a US title, I have been drooling over that one for months.